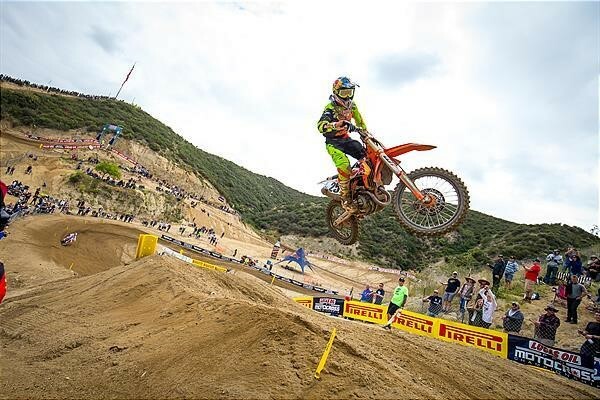 SAN BERNARDINO, Calif. – Round 2 of the 2018 AMA Pro Motocross Championship took place on Saturday at the always-challenging Glen Helen Raceway and KTM’s Factory Racing teams emerged with a pair of second-place finishes at the Glen Helen National. Red Bull KTM Factory Racing’s Marvin Musquin sustained his positive start to the season with second-overall in the 450MX class, while Troy Lee Designs/Red Bull/KTM’s Alex Martin rode his way to a double-podium finish to earn second-overall on the day. In 450MX Moto 1, Musquin got off to a top-ten start where he navigated his way through the chaos to settle into seventh on the opening lap. He put on an early charge to take over fourth by lap two, where he made his move into third by the halfway point. Musquin charged after the lead duo and eventually caught the second-place rider on lap 12 and once he overtook the second-place position, he never looked back. In Moto 2, Musquin shot off the line to capture second off the start and he held a solid pace there for the first seven laps. He made a couple of mistakes that ultimately dropped him back to third in the second-half of the race and he maintained the final podium position all the way to the checkers. With a combined moto score of (2-3), Musquin earned a respectable second-overall from the rough and physically demanding Glen Helen round. It was a great day for Troy Lee Designs/Red Bull/KTM’s Alex Martin, who captured a pair of third-place finishes to claim second-overall at Glen Helen. In Moto 1, Alex got off to a fourth-place start and he quickly charged his KTM 250 SX-F into third on lap two. From there, Martin maintained a solid position to finish third. In the second moto, he captured the holeshot and led the first four laps of the race. He engaged in an intense battle for second in the final laps of the race, ultimately finishing third in the moto and second-overall for the day.